The Carmelite charism is a gift that has come from eight hundred years of Carmelite history and consists of three elements; they are Prayer, Community and Service. A Charism refers to the distinct spirit that animates a religious community and gives it a particular character and identity. For the Carmelites, their Charism is a gift to be shared where Carmelite communities and ministry is found. This Charism is a living action of the work of the Holy Spirit and made manifest through the eight hundred year journey the Carmelites have experienced up to this day. For Whitefriars College, the Carmelite Charism is our Religious Identity and is a living testimony of its members. This Charism can be thought of as a special gift given to the Whitefriars Community as we contribute to the common good and glorify God in the Church and world. The Carmelite Charism is a characteristic of Whitefriars. It defines our ethos and it gives us our unique distinctiveness. Prayer is at the core of the Carmelite spirit. It allows us to grow in friendship with God, to experience God’s love, to ponder the mystery and wonder of life, to search for meaning – all encompass the contemplative dimension of Carmelite charism. In the solitude of prayer, we experience the compassion of God which enables us to live in solidarity with our brothers and sisters. It empowers us to minister and respond to those in need. It also enables us to be patient with and forgiving towards each other. A Community that is full of life is both attractive and prophetic. Christ is present in the heart of our community as well as in the heart of the Church and in the hearts of many people. Coming together with one another and finding communion with Christ provides the central moment of the Carmelite spiritual life. As a Carmelite Community, we are signs of hope, of the potential which we humans can reach with God’s grace. We respond to God’s call and to the Church’s teachings with humility. By our community lifestyle, we can inspire the world to live in peace and to share our concerns, our anxieties and our resources with one another. Our Carmelite Community must be open and welcoming, inviting to share with others the communion of hearts and the experience of God. We must live in the midst of the people, to help them to grow in their relationships with God, themselves, their families, friends and all people. In the midst of the people, we bring them into the love of God, we do not shut them out. 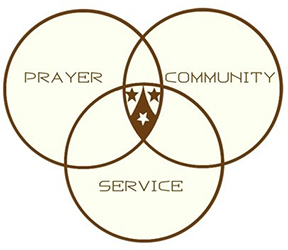 Service is an integral part of the Carmelite Charism. This service is not set in stone, but is a response to the needs of the community. Depending on the need, Carmelites will respond – continually following in the footsteps of Jesus Christ. We are all called to serve the needs of others. It is a lifestyle and spirituality others must see in attitudes and actions that communicate the Carmelite spirit. Through service we are open to its many forms of action, and understand that through these actions we bring Christ to people, where we encounter Christ present in them. As Carmelites we are called to be a living sign of God’s presence and action.